On these trips I usually scout out good viewpoints during the day to check which part of the sky I can see (north, south, east or west) and to see what’s there– level or rough ground, railings or no railings, is there a trail to the view, etc. Point Imperial, 8 miles east of the cabin was promising. 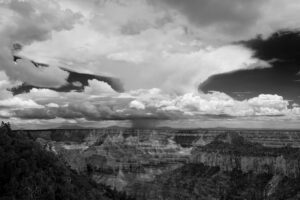 At 8,803 feet, the highest point in the park, it was a truly panoramic view of the canyon and the surrounding high desert. Good views to the southeast potentially would produce nice photos of the Milky Way rising over the canyon. 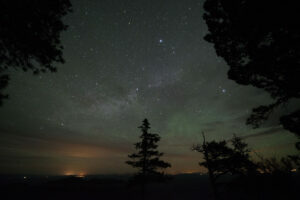 I returned at night to see a string of lights stretching from the north to the south along the horizon. The point is so high you can see the lights of Arizona towns many miles away. In the photo above you can see the glow from Page on the left, from the Gap and Tuba City to the left of the pine tree and assorted small settlements on the right. Very disappointing if you are trying to capture the natural landscape and the sky without any artificial lights. But there are lots of thing going on in this photo. Glow from artificial lights are reflected off low clouds. 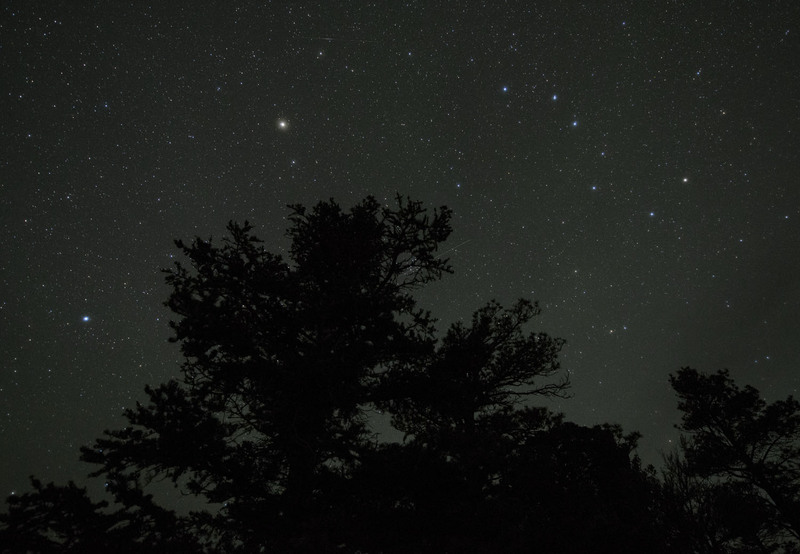 You can see the Summer Triangle, three stars: Deneb, Vega and Altair just above and to the right of the small pine. Deneb and Altair form the base of a triangle with bright Vega at top. There is some greenish glow to the right of the pine tree, I keep thinking it’s a rare sighting of an aurora. My friend Dean Ketelson reminded me earlier there is something called sky glow, which I think is ionized gasses producing a greenish glow that digital cameras can pick up. I kept the color in the photo since it looks so eerie. Part of the summer Milky Way escapes the clouds and arches to the right. 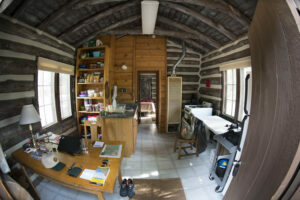 Finally got some photos of the cabin after I tidied up. 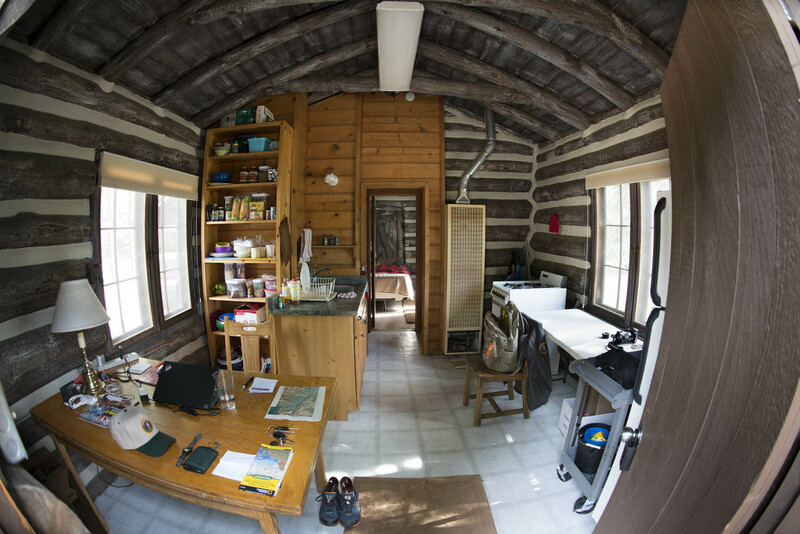 This is a super-wide fisheye view from the front door of the ‘main’ room, which is a work room and kitchen. The big logs that make up the building are great. Through the door in the center is the bedroom and a bathroom is to the left as you go in the door. Lots of nice light and generally quiet. The Big Dipper, Arcturus and Spica. Here’s another shot from Friday night showing the Big Dipper’s familiar shape and it’s handle pointing to the giant red star Arcturus (“arc to Arcturus” is how people remember) and bright Spica on the left. A thin haze left from a passing storm causes these bright stars to really stand out from the countless number that usually show up in pictures. Big storm in the distance. This photograph is STUNNING! Great idea to save it in black & white. It is GORGEOUS! Amazing how much cloud structure we don’t get to see in the East coast, because our skies are so hazy. Wow, is this nice!